Use the supplied mesh and create a tiled grid by repeating this mesh in the x,y, and z directions. # algorithm, stitch_meshes(), only works with ReplicatedMesh. Fig. 2: Tiled cube created from the cube input. Fig. 1: Cube utilized as input to TiledMesh object. 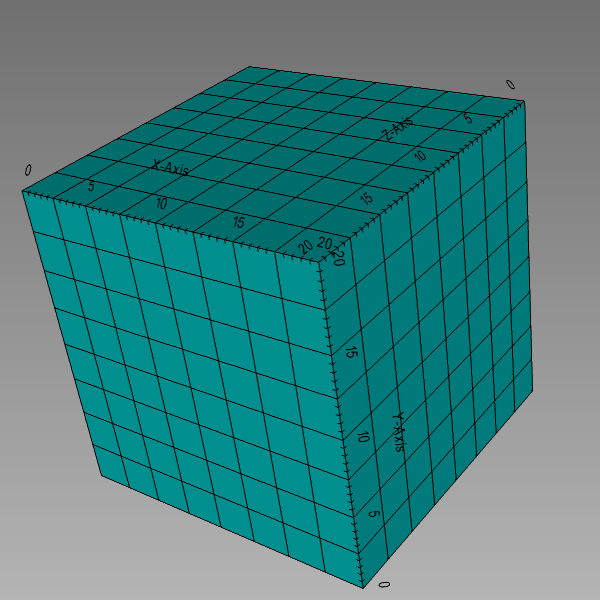 The example utilizes a cube (cube.e) mesh as input as shown in Figure 1, which is a regular cube on the domain from 0 to 10 in the x, y, and z-directions. As specified in the input file for this test (see below), this mesh is then used to create two tiles in the x, y, and z directions. To execute the example and create a new mesh, the moose test application is executed with the special "–mesh-only" flag, which indicates that only the mesh operations should be performed. Running this command will create the resulting mesh file (tiled_mesh_test_in.e), which is intended to be used by a separate input file to run a complete simulation. ghosting_patch_sizeThe number of nearest neighbors considered for ghosting purposes when 'iteration' patch update strategy is used. Default is 5 * patch_size. Description:The number of nearest neighbors considered for ghosting purposes when 'iteration' patch update strategy is used. Default is 5 * patch_size. max_leaf_size10The maximum number of points in each leaf of the KDTree used in the nearest neighbor search. As the leaf size becomes larger,KDTree construction becomes faster but the nearest neighbor searchbecomes slower. Description:The maximum number of points in each leaf of the KDTree used in the nearest neighbor search. As the leaf size becomes larger,KDTree construction becomes faster but the nearest neighbor searchbecomes slower. dim1This is only required for certain mesh formats where the dimension of the mesh cannot be autodetected. In particular you must supply this for GMSH meshes. Note: This is completely ignored for ExodusII meshes! Description:This is only required for certain mesh formats where the dimension of the mesh cannot be autodetected. In particular you must supply this for GMSH meshes. Note: This is completely ignored for ExodusII meshes! nemesisFalseIf nemesis=true and file=foo.e, actually reads foo.e.N.0, foo.e.N.1, ... foo.e.N.N-1, where N = # CPUs, with NemesisIO. Description:If nemesis=true and file=foo.e, actually reads foo.e.N.0, foo.e.N.1, ... foo.e.N.N-1, where N = # CPUs, with NemesisIO. patch_update_strategyneverHow often to update the geometric search 'patch'. The default is to never update it (which is the most efficient but could be a problem with lots of relative motion). 'always' will update the patch for all slave nodes at the beginning of every timestep which might be time consuming. 'auto' will attempt to determine at the start of which timesteps the patch for all slave nodes needs to be updated automatically. 'iteration' updates the patch at every nonlinear iteration for a subset of slave nodes for which penetration is not detected. If there can be substantial relative motion between the master and slave surfaces during the nonlinear iterations within a timestep, it is advisable to use 'iteration' option to ensure accurate contact detection. Description:How often to update the geometric search 'patch'. The default is to never update it (which is the most efficient but could be a problem with lots of relative motion). 'always' will update the patch for all slave nodes at the beginning of every timestep which might be time consuming. 'auto' will attempt to determine at the start of which timesteps the patch for all slave nodes needs to be updated automatically. 'iteration' updates the patch at every nonlinear iteration for a subset of slave nodes for which penetration is not detected. If there can be substantial relative motion between the master and slave surfaces during the nonlinear iterations within a timestep, it is advisable to use 'iteration' option to ensure accurate contact detection. construct_node_list_from_side_listTrueWhether or not to generate nodesets from the sidesets (usually a good idea). Description:Whether or not to generate nodesets from the sidesets (usually a good idea). patch_size40The number of nodes to consider in the NearestNode neighborhood. Description:The number of nodes to consider in the NearestNode neighborhood. partitionerdefaultSpecifies a mesh partitioner to use when splitting the mesh for a parallel computation. Description:Specifies a mesh partitioner to use when splitting the mesh for a parallel computation.